Last week, Wendy's and agency VML launched a campaign spoofing the explosion of food videos that have popped up in Facebook newsfeeds in the past year. Like the popular videos created by the likes of BuzzFeed's Tasty, Tastemade and others, the video was shot and uploaded in the shape of a square that fills the full space of a newsfeed when viewed on a mobile device, where the bulk of Facebook content is viewed. At first glance, the video seems like the type of garden-variety campaign Facebook has been pushing brands to design for a couple years as it builds up its ad business on sibling app Instagram. The idea is that square video works on Facebook and, more importantly, plays double duty by working on Instagram, which is built around square photos and videos. Wendy's campaign is different though—the clip will only run on Facebook and won't touch Instagram, indicating that Facebook is taking a page from Instagram as it builds its video platform. For VML's Wendy's team, it also marks the first time the agency has designed a square-shaped video solely for Facebook. "We shot it in two different formats: Your average 16:9 so that you can use it on YouTube, and we also shot in a square or box format because that's in line with Facebook's best practices," said Daniel Lobaton, VML's creative director. At the same time Facebook is urging brands to create similar creative for Facebook and Instagram—and putting more money into the latter to make sure posts don't get lost in the newly launched algorithm—brands are taking the same lessons from Instagram and applying them to Facebook. "Instagram and Facebook are pretty much one and the same as far as the approach to square formats," said Ben Krantz, creative director at Attention. "It's like the new billboard in the sense—no one wants a smaller billboard, and people want to get the most out of the space." 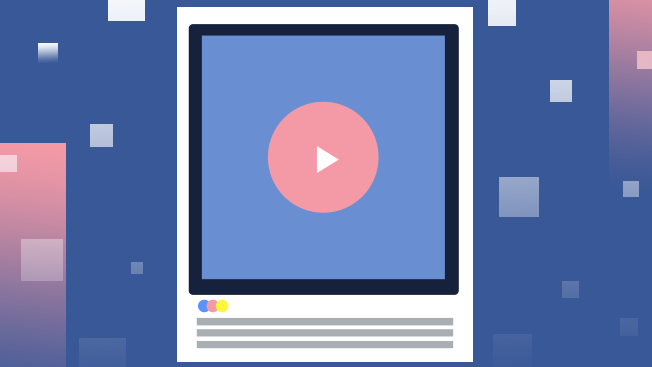 In April, Facebook updated its creative guidelines with a recommendation that brands start swapping out 16:9 aspect ratios traditionally used for television ads with 1:1 ratios in the shape of a square that are designed for mobile. Already, some agencies are seeing Facebook-specific square videos pay off. Digital shop Laundry Service, for example, has run multiple tests comparing horizontal and square videos for its clients. "For the past several months, we have started shooting videos for square crop and posting videos in square crop," said Jason Stein, founder and CEO of Laundry Service. "We are doing this because in executing the media buys for these videos, we found that view-through rate and engagement rate are much higher on square than landscape videos. This is likely due to the larger amount of real estate that a square video gets in feed." In Laundry Service's data, view rates for square videos are 28 percent higher than horizontal content. When looking specifically at view-through rates for the first 10 seconds of a video, 1:1 videos outperform 16:9 clips by 54 percent. And people are 67 percent more likely to watch the full length of a square-oriented video than they are to watch a horizontal one. That doesn't mean the shift to square video is easy for marketers. In addition to testing square and horizontal video, Snapchat has made vertical video mainstream, and advertisers are constantly tweaking the length of creative to fit new ad formats. Plus, traditional horizontal videos still give brands the most real estate to play with and is the primary format that advertisers shoot video for. "It's out of habit and what we're most comfortable with—ultimately it is the most beautiful form we can do for video because [16:9 videos] are at its largest state," Attention's Krantz said.